[PDF] Hollywood and Anti-Semitism: A Cultural History up to World War II (Cambridge Studies in the History of Mass Communication) | Free eBooks Download - EBOOKEE! Description: American Jews have a powerful cultural narrative that seemingly speaks on their behalf. According to this narrative, Eastern European Jewish immigrants built the film industry in the first decade of this century and dominated it by the second. 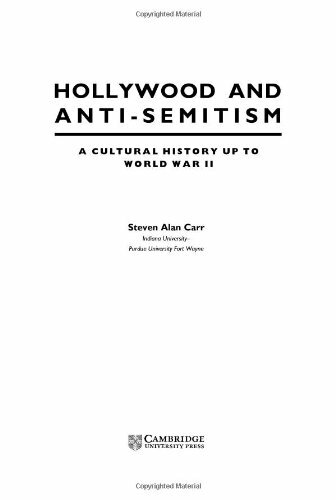 As opposed to determining a particularly Jewish vision of America, Steven Alan Carr argues that this way of looking at Jews in Hollywood emanates from a particularly American vision of Jews. Like the Jewish Question of the 19th century which fretted over the full participation of Jews within public life the Hollywood Question of the 1920s, 30s and 40s fretted over Jewish participation within the mass media. As a whole way of thinking and talking about both Jews and motion pictures, Hollywood and Anti-Semitism reveals a powerful set of assumptions concerning ethnicity, intent and media influence. Steven Alan Carr is an Assistant Professor of Communication at Indiana University-Purdue University, Fort Wayne. His work appears in Cinema Journal and other publications. This is his first book. No comments for "[PDF] Hollywood and Anti-Semitism: A Cultural History up to World War II (Cambridge Studies in the History of Mass Communication)".